Mom and dad died. Most of the adults died. Those adults who survived all went blind. We found out that they needed us, needed our ability to see, so badly that they were willing to take us from our homes and lock us up in chains. We learned we were strong and smart enough to escape. We learned to run from adults, and in many cases we taught them to run from us. A world run by kids is a scary place to live. There are diseases, wild animals and traps. There are cults, gangs and rogue military units. And then there are kids. Sometimes kids can be mean, and that can be dangerous. And sometimes kids try to do what they think is the right thing, and that can be even worse. A complete game; no other products needed to play. A starkly realistic, fully realized world, detailing every possible danger in a land ruled by kids. Play as a kid, a semi-blind adolescent or a fully blind adult. Create the players' home community with community creation rules or hit the road and see what awaits you. 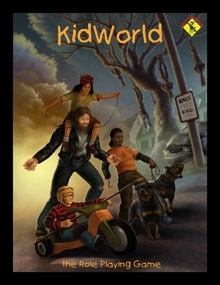 Includes KidNight, an optional supernatural horror setting based on the beliefs of kids. Also includes KidWorld-L, a light character creation and rule system suitable for light or live-action play. Uses Organic Rule Components, the same rule system as Fates Worse Than Death, Tibet, In Dark Alleys and Hoodoo Blues. Is there a print version available? Yes there is. We're not yet using DriveThru's print service, and it's not appropriate for me to link to other storefronts on DriveThru's site, but if you search for Vajra Enterprises you'll find our website which will list all the sites (and formats) our books are available in/from. This title was added to our catalog on April 11, 2010.